brought back for me from Holland, pictures of our pups, etc! travel momentos (love the postcard from our trip to San Francisco! ), etc. our moving announcement into our new house! This post wraps up my little "Not So Valentiney" Valentine's Day gift idea series! Hope some of these ideas were helpful! Happy Friday to all of you! Any big plans this weekend? with you on Monday!! Happy Superbowl weekend, friends! Have a great weekend Michelle. Love your wedding photo. You must have been a beautiful bride. 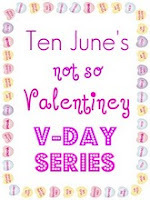 your Not So Vday series was TOO cute! Loved all the ideas ... as always! Great series Michelle!! Love all of your ideas - simple, sweet and personal...which is what Valentine's Day is all about in my book! Have a great weekend! I love all the special touches you guys have in your home. We got 6" of snow last night...holed up again!!! I love all the little touches. I got my bouquet preserved and framed, too. I love it. It's in our living room now (I figured we're still newlyweds so I can get away with it.) I'll probably move it to the upstairs bedroom or hallway when we move. We'll see. I really like the wire frame. reminds me of a wood version that my friend Carrie at Brick City Love put together. So many creative minds on the Net. Yay! All of these are so cute. Great ideas. 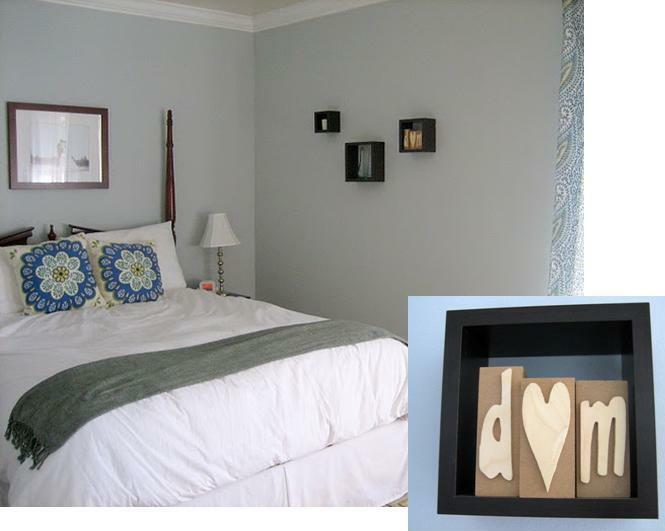 I LOVE that wedding picture above your bed. It's precious! Great idea for your bouquet! I have a bouquet I caught at a friend's wedding last year sitting around needing a place to hang. And also to remind my boyfriend when he comes to visit of my catchings! I love the stripes on your office walls! Have you blogged about how that is done? My daughter is wanting purple stripes as an accent wall for her upcoming room re-do, and I am clueless!!! 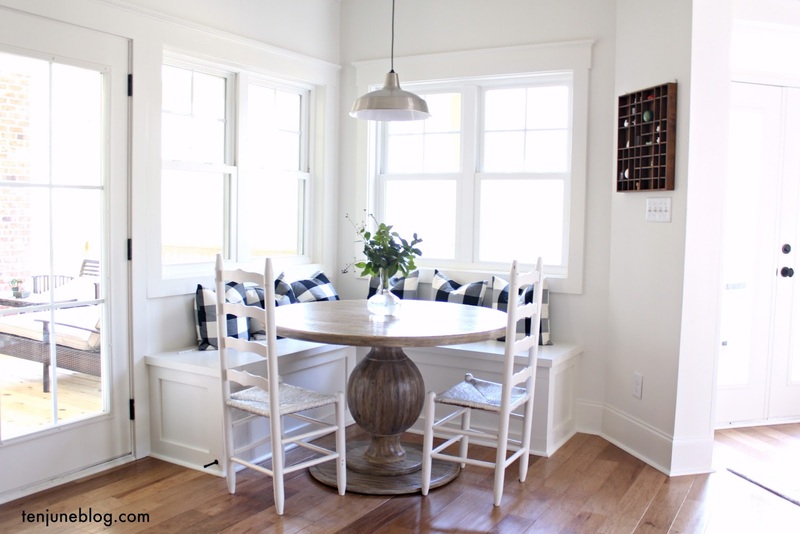 I love all the little touches you have around your home! Good luck with the bathroom this weekend. I am hoping it's nicer tomorrow as we are supposed to help the older clean her carpets (hoping it helps her allergies). i love your wire picture frame. I am trying to come up with something for behind my computer, this one is definitely in the running! Y'all have the best little decorations around the house! I love the moving announcement and wire frame! Love the moving announcement! That is TOO cute!! All of these posts have literally left me dying to see more wedding stuff of y'alls!! Please??!! 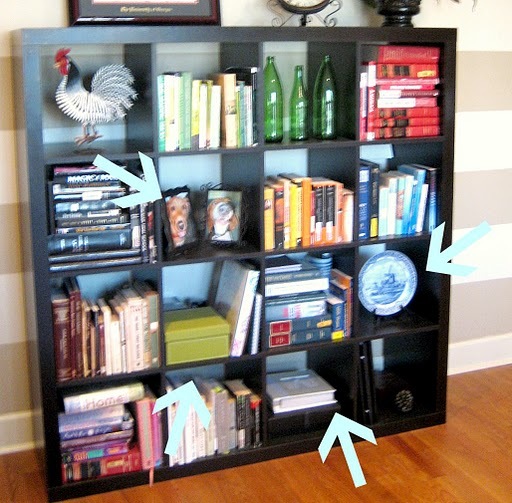 I love your organized-by-color bookcase! 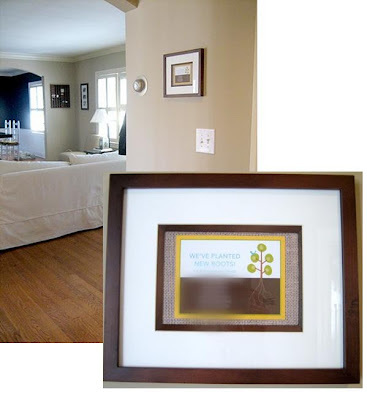 ohhhh LOVE the wire picture frame! SO glad you stopped by my blog - I agree, I think we may be bloggy soulmates! HA! Also, so cool that your grandfather was the Tybee lighthouse keeper! Must hear more about this! Hope you had a great weekend!!! precious. Love all of these little momentos around the casa. so sweet. such great ideas!! Happy Monday!